The Mini Super Twos formula made its second and final visit to the famous Wimbledon Stadium on 12th February, competing in what will be their only London Championship at the fabled south London track before its closure in March. A large crowd braved the bitterly cold winds and enjoy an evening of close racing from all four formulas in attendance, with the Mini Super Twos offering plenty of two and three-wide action across both heats and their London Championship race. The event saw the first appearances in the category for Mark Pope, standing in for reigning British Championship winner Mark Sanders, banger favourite #201 John Dodge and Christof Vandekerckhove, a track official and racer at the Warneton Speedway in Belgium. 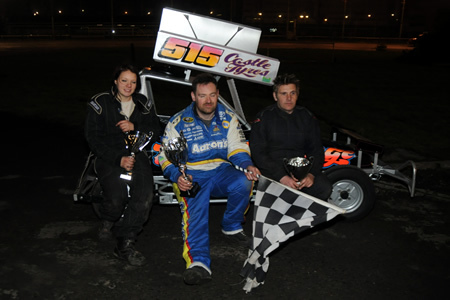 #70 Rob Dance and #16 Courtney Smith won the first and second heats respectively with #515 Craig Driscoll taking the London Championship title from a closed grid. #16 Courtney Smith and #231 Matthew Clayton completed the podium with Dance and Vandekerckhove rounding out the top five. Despite a spirited campaign by the motorsport community that included the presentation of a 10,000+ signature petition to 10 Downing Street the stadium buildings are scheduled for demolition later this year. Mini Super Twos organisers and drivers would like to thank Deane Wood, Dean Cox and Spedeworth for giving us another opportunity to savour racing at the 'Grand Old Lady' before the era of short oval motorsport in the capital draws to a close. Thank you to Raymond @ Petrolhead Images for the headline photo and Keith Hobson for the photo of the London Championship trophy winners.